You'll be £19.99 closer to your next £10.00 credit when you purchase Magnum! The Wild Weasels in Desert Storm. What's this? This book is based on a journal Jim Schreiner kept during his deployment to the Persian Gulf region for Operations DESERT SHIELD and DESERT STORM. Building upon that record and the recollections of other F-4G Wild Weasel aircrew, the authors show a slice of what life and war were like during that time. The pawns in the game, the ones that had to actually do the fighting and dying, were the hundreds of thousands of men and women who left their homes and families to live for seemingly endless months in the vast, trackless desert while the world stage-play unfolded. To them, the war was deeply personal. At times, the war was scary; at other times, it was funny as hell. Usually, if you survive the former, it turns into the latter. Definitely a recommended book to all aviation enthusiasts. When Francis Gary Powers’ Lockheed U-2 spy plane was shot down by a Soviet surface-to-air missile, a new sort of air-to-ground war began that would resume in earnest over Vietnam when SAMs became a regular feature of North Vietnam’s air defenses. The threat became manifest on July 24, 1965, when an SA-2 SAM shot down a MacDonnell F-4C Phantom II. More losses followed, and in August the U.S. Air Force chief of staff, General John P. McConnell, directed Brig. Gen. Ken Dempster to come up with a solution to the SAM problem. It took the form of fighter-bombers fitted with specialized electronics as radar “ferrets” that would actively seek out SAM sites to destroy or at least neutralize them. The concept, which would come to be known as “Wild Weasel,” was applied in a succession of aircraft: the North American F-100F (Wild Weasel I), Republic F-105F (Wild Weasel II), F-105G (Wild Weasel III) and EF-4C (Wild Weasel IV). 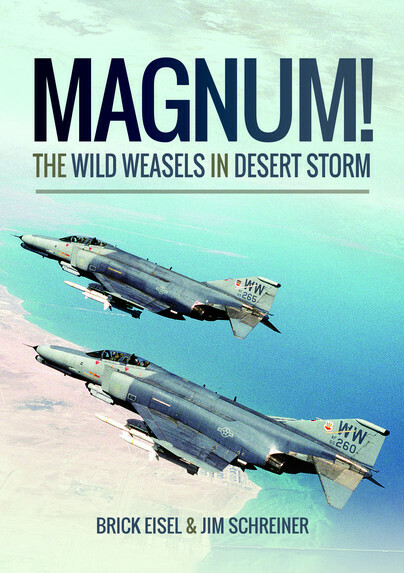 After the 1973 Yom Kippur War, during which SA-6s shot down one-third of the Israeli air force, the U.S. Air Force produced its ultimate SAM killer, the McDonnell-Douglas F-4G Wild Weasel V. In Magnum! “Brick” Eisel, a former Pentagon staff officer and author of Beaufighters in the Night: 417 Night Fighter Squadron USAAF, teams with Jim Schreiner, a retired Air Force major with more than 4,700 flying hours, to examine the F-4G’s record, alone or paired with a General Dynamics F-16, to penetrate Baghdad’s defensive ring of Soviet-installed SAMs and anti-aircraft artillery during Operation Desert Storm. The book is based on a journal Schreiner kept during his deployment to the Persian Gulf region for that operation, combined with records he collected. Eisel and Schreiner conclude that by modifying an outdated airplane, the Air Force succeeded in defeating the Soviet air defense system and taking some revenge for its losses in Vietnam. This is an interesting read all round, about the operational experiences of one pilot in particular, undertaking a very specialist role in a long serving aircraft. Well illustrated throughout with copies of documents, diagrams and archive photos, I am sure it will appeal to the many Phantom fans out there as well as the military aviation historian. The authors are both experienced tactical pilots who have served in the USAF & Schreiner flew F-4G Wild Weasels during the desert campaign. This is a very important book that looks into the largely untold story of the electronic war that is critical to modern air warfare – Highly Recommended. Jim Schreiner flew a Phantom F-4G Wild Weasel fighter throughout the desert campaign. He and many of his fellow pilots have contributed to this book.